At least 200 antinuclear activists have blocked the gates to Faslane naval base in Scotland, a home of British nuclear submarines armed with Trident intercontinental ballistic missiles, according to social media posts. Protesters demand scrapping of UK’s nuclear weapons system and promise not to leave until 15:00 GMT. Activists from the Scrap Trident coalition’s “Bairns Not Bombs” gathered near entrances to the base by 7 am local time, the Scotsman reported. Police who arrived at the scene did not intervene, merely forming a line between the protesters and the gates. The event was called to draw attention to the British government’s plans to replace the current Trident missiles with a new generation nuclear deterrent. Last week, UK Defense Secretary Michael Fallon confirmed that the Conservative-led government has decided to go ahead with replacing the existing fleet of Vanguard-class nuclear submarines with four new Trident nuclear missile carriers. Britain possesses four Vanguard-class nuclear submarines, one of which is on patrol at any given time. The first of the subs entered service in 1992.Each Vanguard sub is capable of carrying 16 Trident ballistic missiles, with eight thermonuclear warheads on each missile. Every year London spends £3 billion to keep its nuclear deterrence forces operable. If the British government decides to pursue the nuclear rearmament project, the new subs are likely to enter service no earlier than in 2028. In the face of the upcoming general election in the UK in May, the Scrap Trident coalition is holding a series of demonstrations, the first of which was held in Glasgow earlier this month. “Trident is an obscenity,”Patrick Harvie, co-convenor of the Scottish Greens party and a member of the Scottish parliament for Glasgow, told The Scotsman.“Through direct action and through the ballot box we can make the case for the UK to play a new role on the world stage,”he said. 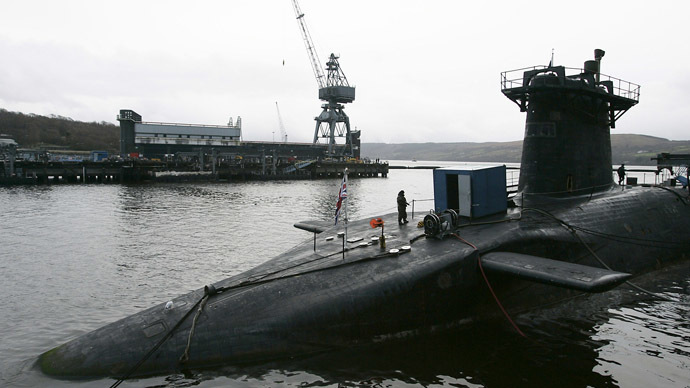 Scottish military bases have hosted British nuclear weapons for the last 50 years. The Faslane naval base employs 7,000 people.